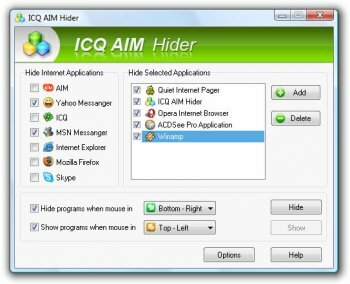 ICQ AIM Hider is a protective tool that allows you to hide running applications and tray icons completely with a move of the mouse or a single hotkey. It's very useful when you need privacy and don't want others to see what websites you are viewing in your browser, what programs you are running, what games you are playing. ICQ AIM Hider allows you instantly hide selected programs instead close or minimize them. Also our program can hide any application when it loads on Startup.